Production Summary: Eleven of the album's twelve songs were written and recorded specifically for this album. 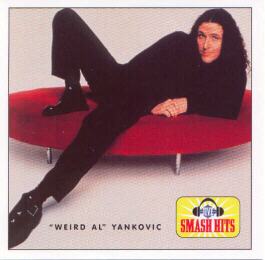 "The Weird Al Show Theme," of course, had been recorded back in 1997 for the CBS series of the same name. Dr. Demento Status: All twelve of the album's songs have aired on the syndicated Dr. Demento Show, with the last song to premiere on the show being "Grapefruit Diet" on August 15, 1999. Interestingly, "Polka Power!" aired on the program only once, on July 18, 1999. Tour Status: As of this update, 91% of this album has been included in a regular tour setlist. Al's first new album from his own imprint Way Moby, spawned from his new label, Volcano Entertainment. Al's first album to not be promoted with any commercial singles, due to a "no singles" policy at Volcano. Running with Scissors marks the return of BMG distributing Al's material, as per a distribution deal with Volcano. BMG would eventually acquire Volcano's parent company, Zomba--and in 2008, BMG itself would be acquired by Sony Music, the latest incarnation of Al's initial album distributor, CBS Records. There are two stories as to the origin of the album's concept. In November 1999 Bermuda posted on alt.music.weird-al that "Running With Scissors" was to be the original title for Bad Hair Day back when the album was in production in 1995 and before Al decided to parody Coolio, thus creating a new "look" for the album. 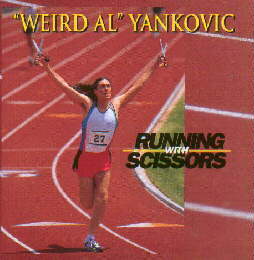 Yet in August 2006 on the Weird Al Show: The Complete Series DVD, Al explained in the commentary for the "One for the Record Books" episode that a discarded segment that was written, in which Al presents a home movie of his days as a track star in which he wielded scissors as he ran (thus seriously injuring the other runners), was the inspiration for the album. Also, this is the first album cover to feature Al's new, mustache-less, glasses-less look! AND, the CD is the first Al release to feature that magical number "27" on the cover! Features Al's longest song (not counting material on Peter And The Wolf), "Albuquerque." Debuting at #35 in Billboard, it would jump into the top twenty a week later, becoming Al's fastest selling release. It would eventually stay on the "Billboard 200" chart for thirty-two weeks. The CD of this album contains bonus multimedia items to be used on a PC (a first for Al). It includes a movie file from the Disney Channel special There's No Going Home and an accompanying text file of "instructions." The first album to feature Rubén Valtierra (sort of) in the booklet pictures. Only the second album to credit Jon "Bermuda" Schwartz with vocals (the first being the debut album). Zomba Records included the above Al collector card with the Australian issue of the CD. This page was last updated March 15, 2019. Scans of Canadian sticker, Australian sticker, and collector card courtesy of Dave "Elvis" Rossi. Running With Scissors ©1999 Way Moby/Volcano Entertainment III.